ADPKD is caused by mutations in PKD1 and PKD2 genes. Symptoms of ADPKD generally appear between 30 to 40 years of age. If a parent has the disease, then the probability of having a disease in children is 50%. 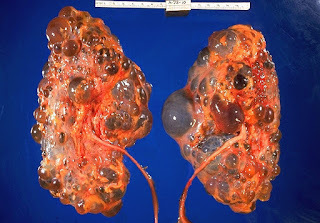 ARPKD is hereditary renal disease of childhood. it is very rare than ADPKD. Mutations in the PKHD1 gene are responsible for ARPKD. For having the disease in children one gene of ARPKD from each parent must be transferred to their offsprings. It develops in people who have already kidney diseases. It is not inherited. Urine examination to detect protein, blood or any cells in the urine. There is no specific treatment is available to reduce cyst growth. The main focus of treatment is on slowing renal disease progression and lowering cardiovascular risk. Surgical interventions to remove cysts.